Mark walked many miles to visit the many sites in Oxford associated with J.R.R. Tolkien and C.S. Lewis. Here, Mark and Pablo are at the famed Eagle and Child Pub where Tolkien, Lewis and other members of the writing group, the Inklings, met to share their writing. The photo of Mark standing is in the room where the Inklings typically met. The Abbot's kitchen is the only structure to remain standing. Established in the 7th century, the great cathedral and cloister are in ruins, but the gardens evoke a sense of those earlier centuries. The magnificent Glastonbury Abbey was once the largest cathedral in the nation. The grounds are still beautiful with lavender, hollyhock and all manner of herbs. Ruins of the cathedral remain but what was once a flourishing center is now a shadow of its former self. Our favorite villain, Henry VIII, was the cause of the destruction of Glastonbury. We learned that not only was the Abbey sacked and the wealth of the Abbey transported to London, but that the local town and townspeople experienced great poverty as many of the townspeople depended on the economic engine of the Abbey for their livelihood. 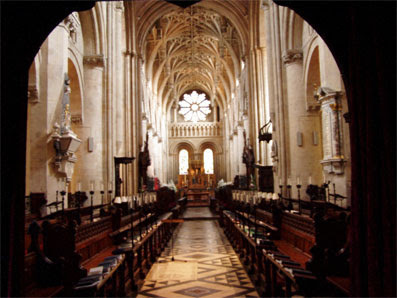 In 1536 there were 800 monasteries in England; in 1541 they had all been closed or dismantled. For readers of the Arthurian legend, the grave of Arthur is said to be at Glastonbury Abbey. The grave is just to the right in this photo. There are remains of a king that were found on the Abbey grounds and transferred to this site. Malory gives us the great epitaph that is said to be on Arthur's grave stone: Rex Quondam, Rex Futurus--the once and future king. But as readers of Malory know, Malory writes that he is not saying this is so, but what others believe. While not related to Arthuriana, this stained glass window in the Cathedral is an amazingly beautiful work of art. But look closely: the stained glass was destroyed during the English Civil War; the legend is that Cromwell's soldiers destroyed the massive window. But parishioners picked up the shards of glass that formerly depicted saints and, during the restoration, restored the great window as a mosaic. It is startlingly modern looking--with an occasional partial figure of a saint. Now it is a beautiful abstract mosaic of glass and an incredible testament to the parishioners who literally "picked up the pieces" and made new art from the shards of the old. "Dutch" treat at the Angel and Greyhound. Many happy returns of the day Judith! 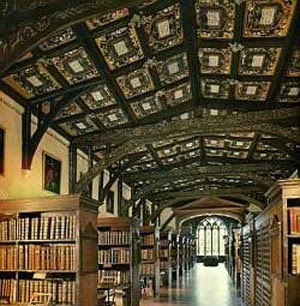 Completed in 1598, St. John's College library was the first college library to innovate with the placement of desks and pew-like seats in between the stacks of the books. The library ceiling harkens back to its Tudor origins. On display during our visit was the 2nd edition of Caxton's Canterbury Tales. This printed book is rare in that it is the only surviving copy with colored woodcuts from the second edition. Behind the College is a lovely garden. We didn't let the constant rain keep us from a brief walk. The Queen's College library is one of the largest libraries of the Oxford colleges in terms of the number of volumes held in the library. Located on the second floor, the library design was influenced by the great English architect, Christopher Wren. Wren designed the famed library at Trinity College at the "other" English university, Cambridge. The college displays here a terrestrial and a celestial globe from the 17th century. Queen's College was one of the wealthier colleges and thus tore down the "old" medieval buildings and erected neo-classical buildings in the 18th century. In the quad of the college are our fearless leaders: Jim Bracken, John King, and Mark Rankin. The boys' choir of Christ Church and congregation sang this hymn by Jan Struther (1901 - 1953) set to a traditional Irish ballad tune. To hear the tune (missing the soaring voices of the boys' choir) click here. Many of the seminar members spend a good part of our day in the justly famous Duke Humphrey's Library, the rare book and manuscript library of the Bodleian. Today I will be working with the 1527 edition of Caxton's Myrrour of the World as well as availing myself of the incredible number of catalogues of collections that are held in the reference section of the Duke Humphrey Library. As Dr. Vaisey, Director Emeritus of the Bodley, said on our tour, "Great libraries should collect things beyond the needs or understanding of current scholarship." Many of the manuscripts and books in Duke Humphrey's library are available to scholars because of this philosophy. It seems appropriate here to include a text I have been interested in for a while. A perfect confluence of interests: early printed books and rowing. The complete title: Taylors vvater-vvorke: or the scullers trauels, from Tiber to Thames: with his boat laden with a hotch-potch, or gallimawfrey of sonnets, satyres, and epigrams. With an inkhorne disputation betwixt a lawyer and a poet: and a quarterne of new catcht epigrames, caught the last fishing-tide: together with an addition of pastorall equiuocques, or the complaint of a shepheard. An earlier edition was printed at London by Edward Allde with the announcement that copies "are to be solde [by Nathaniel Butter] at the Pide-bull neere St. Austins gate, 1612." This particular edition, at the Bodleian Library, was printed in 1614. Every rower's dream. Erica invited me along to her class with the Oxford Rowing Club. It was a great group of eight beginners; we experienced the classic British teaching technique of ironic humiliation laced with good humor at the end. The other rowers are local Oxfordians. A beautiful workout on the river.